The F6150SV tests protection relays and schemes. It tests individual components or an entire scheme and assesses protection system performance for analog testing of 1A and 5A protection devices. 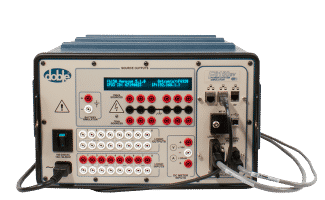 It offers IEC61850 testing as well as Sample Value Process Bus and Station bus applications in one test set. High impact, molded, flame retardant ABS meets National Safe Transit Association testing specification No. 1A for immunity to severs shock and vibration. (15 x 9.5 x 18) in. (38 x 24 x 45.7) cm.